This chapter acts as an introduction to a mindwalking universe. It defines the similiarities between Psionics, Mindwalkers, and Talents. There are sections on Psionic powers in the real world and the Alternity enhanced world. Character design is the primary function here. Also included are rules on alien mental powers and advanced mental combat. This chapter covers various character types and campaign types. 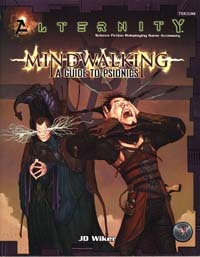 The last area contains data on psionic equipment, creatures, phenomena, and Artifacts. There is also a piece on campaign design.